Most motorcycles have a linear life cycle. Once their design is green-lit, it’s only a matter of time before the bike goes from the drawing board to the open road. Eventually, these bikes are improved upon and replaced by newer models, only to take their place in history. That is, of course, unless a team of dedicated individuals puts their creative juices towards remixing these classic rides and give them a second wind. Forged from passion, these two-wheelers have been customized and given a personal touch by the people who care about them the most. The board track racing era had a solid 20-year run in the early 20th century. Although the sport was short-lived, it did gain considerable attention from racing enthusiasts in both America and India. The love of the sport led to the creation of some stand out motorcycles from both countries. 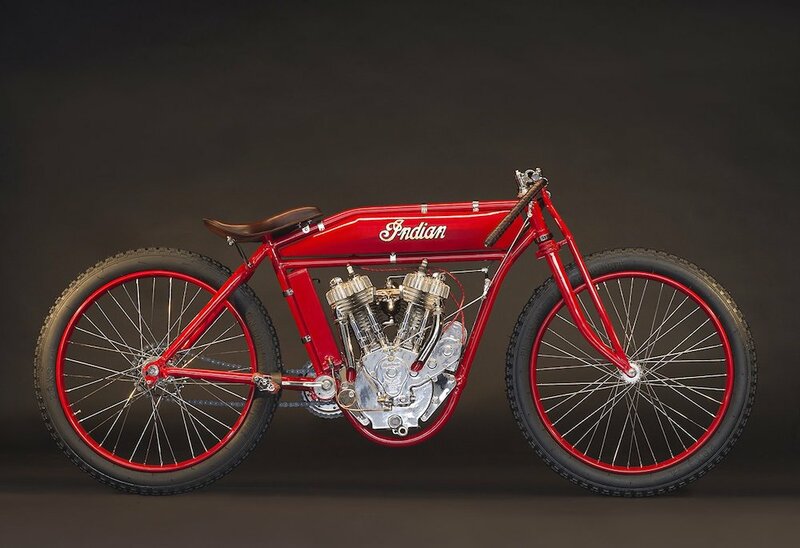 Now a century old, the 1918 Indian Twin Board Racer has been reassembled and restored to its former state of glory. Thanks to a masterful restoration process, the Board-Track Racer is made of mostly original parts, making it a high commodity among collectors. It took Death Machines of London over 100 days of hard work to bring this work of art to life. The Moto Guzzi Lemans MK II Airforce pays respect to World War I veteran and Moto Guzzi founder Giovanni Ravelli (1887-1919). Death Machines of London restored the “Airforce” from its corroding post-collision state in Southern Italy to the modern marvel that it is today. The frame and front wheel have been coated in a custom Airforce Grey, and the redesigned speedometer now features dimmable radial illumination. Nearly every component of the Airforce, from the rear suspension to the internal throttle, is custom made. The Aviator truly captures Ravelli’s radical aviation spirit. 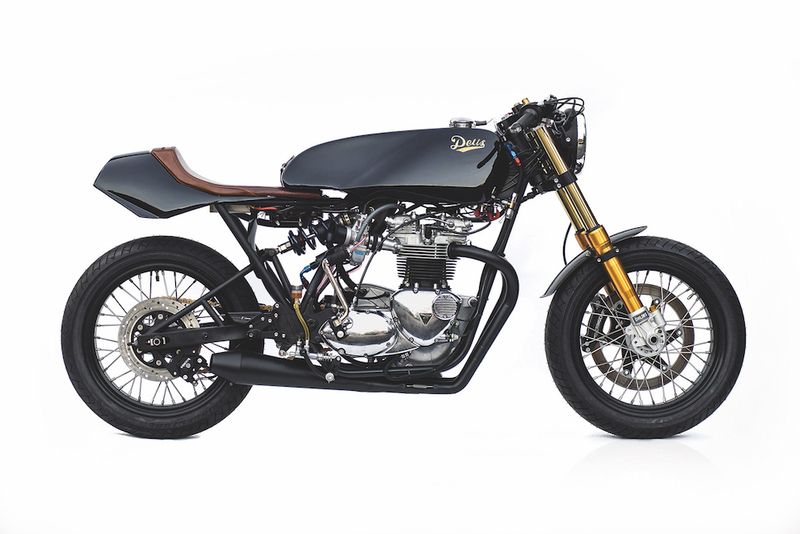 The TTT is a standout custom motorcycle brought to us via the creative geniuses at DEUS EX MACHINA. Personally crafted by Michael “Woolie” Woolaway, the TTT is powered by a 750cc T140. Its frame is one of two custom-made by C&J, built specifically for the motor. Styled after ‘60s Japanese Grand Prix racers, the long angular aluminum tank is handmade by Woolaway and has been painted in a black candy over a black base coat. Don't let the eye candy fool you, this bike packs an impressive road performance as well. Geoff Baldwin, a journalist from Return of The Café Racer, was one of the many journalists who, back in 2016, got to witness the unveiling of Triumph’s Bonneville. After laying eyes on the now two-year-old T120, Baldwin decided to do a custom build. As you can tell from the name of his website, Baldwin refrained from turning the bike into a chopper, and chose to focus the Bonneville’s 55th anniversary as a starting point. While designing the custom T120, he realized that Rickman was also celebrating its 50th anniversary. Baldwin drew inspiration from the Rickman brothers’ designs, implemented them to his custom T120 Bonneville, wrapped it in a fitting emerald green and gold coloured paint job, and the rest is history. Limited to only 36 examples, the hand-built Warhawk is the first Curtiss Motorcycle build in over 105 years, while at the same time being the last gasoline-powered motorcycle the company will make before they focus solely on sustainable electric-powered bikes. The Warhawk, powered by an air-cooled 2200cc V-twin, has been brought to life to pay homage to the company’s namesake, motorcycle and aviation pioneer Glenn Curtiss. Capable of reaching a top speed of 180mph, the Warhawk is a massively powerful machine and features a unique see-through cam chest and fuel tank. Ironwood motorcycles are relative newcomers in the custom bike world, having produced only a handful of custom BMW bikes in the last six years. Be that as it may, the Amsterdam-based manufacturer still manages to impress us with its custom BMW R80 “Mutant” café racer. Its ostentatious raw metals and vintage paint job are reminiscent of Street Fighter motorcycles from a decade ago. Much like the original 1985 BMW R80, the Mutant holds on to the mono-shock and single-sided swing-arm. What has changed is the new longer bespoke Hyperpro suspension coil which creates an extreme stance and pitches the rider forward. To draw attention is the custom exhaust, which so happens to sit pretty under the Mutant’s Alcantara and soft leather seat.